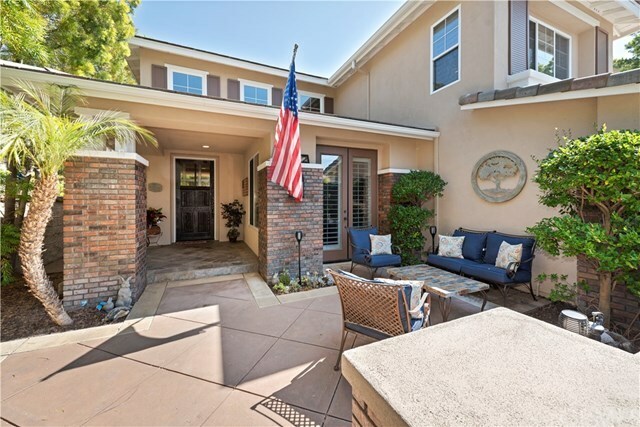 Welcome to prestigious, guard-gated Canyon Crest-Mission Viejo's premier community. This stunning 5-bedroom, 5-bath home is tucked at the end of a quiet culdesac on one of the neighborhood's larger pool-sized lots. Classic Craftsman-inspired architecture and manicured landscaping greet you as you enter through the peaceful front courtyard. Inside, you'll find soaring ceilings and an open floorplan, accentuated with a designer palette and warm finishes. A downstairs office with French doors has been reimagined as a elegant wine room, ideal for intimate gatherings. The downstairs guest suite offers its own private full bath. There is an additional 3/4-bath on the main floor. The chef's kitchen opens to the family room for ease of entertaining, and has a 5-burner gas range, double ovens, built-in fridge, pots & pans drawers, center island with bar, and a walk-in pantry. Upstairs is a sumptuous master suite with fireplace and dual walk-in closets. Two large secondary bedrooms have built-in desks and share a Jack & Jill bath. A large 4th bedroom is ideal for a theater, game room or bonus room, and is adjacent to another full bath. The rear yard has a terraced garden, built-in BBQ, lawn, covered patio, and surround-sound speakers indoors and out. Plus the resort amenities of Canyon Estates: tournament quality tennis courts, 3 pools, fitness facility, sport court, clubhouse & more. Lake Mission Viejo membership included, with boating, swimming, fishing and concerts. WELCOME HOME! Directions: From Alicia, turn into Rustic Oak gate to enter the community. Turn left on Applegate, left on Sweetmeadow. Home is last house on the left.